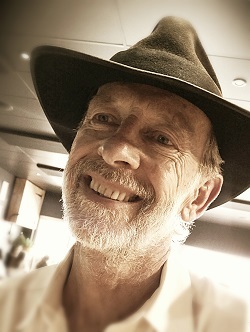 One of Australia’s premiere performance poets, David Hallett has been writing and performing his poetry since the mid-70’s. During the past 40 years David has developed an innovative, accessible, highly entertaining and original form of spoken word performance. Twice winner of the Poetry Olympics at the Sydney Writers Festival at the Opera House in 1995, and again in ’97 at the Lyric Theatre. Byron Bay Writers Festival Poetry Prize in 1999, the Nimbin Performance Poetry World Cup 2003 and the Spirit of Woodford Story Award 2005, the Woodford Festival Wordfood Poetry Slam 2012 and Byron Bay Writers Festival Poetry Slam 2013. He has performed and toured extensively at festivals, schools, colleges, universities and Writers Centres; from cafes to cabarets to conferences, and radio and television. 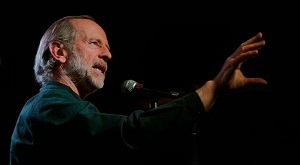 For over 25 years David has managed and hosted two major spoken word venues on the North Coast of NSW: Byron Bay’s ‘Writers at the Rails’ and Lismore’s ‘Live Poets!’ He also featured at festivals and tours with the performance troupe the 'Stand Up Poets' together with S Sorrensen, Christine Strelan, David Heilpern and Shana Gelin. Since the mid-90s David has been giving poetry performances and masterclasses for high school students in English and Drama, and for tertiary students of creative writing. He has presented HSC masterclasses on Judith Wright, Emily Dickinson, Bruce Dawe, Peter Skrzynecki and Ted Hughes; and he is currently giving HSC presentations on Wilfred Owen, Sylvia Plath and John Donne/Margaret Edson (with comprehensive study notes); together with his own popular and well reviewed performance show 'Rhythm, Rhyme & Rap'. David Hallett’s poetry is broadcast regularly on ABC-Radio 2NR, and his poetry has featured on Triple J and Radio National’s ‘Poetica’. David has also performed on ABC-TV’s ‘Sunday’ arts show, as well as ‘Bookchat’ and ‘Quantum’. David also featured in the ABC’s National Poetry Day show ‘Voices’, and his poetry featured prominently in the SBS documentary ‘Nearly Normal Nimbin’. David also has a new schools and festivals show titled 'A Century of Australian Poetry' featuring a carousel of Oz works by CJ Dennis, Henry Lawson, Judith Wright, and Kath Walker, as well as poems by Dawe, Skrzynecki, Komninos, Tipping...and Hallett. As one reviewer wrote of his performance: “This is not poetry to be savoured in wistful repose. This is stand up knock down stuff to split your sides in laughter or rage. Sexual politics, social politics, political politics; this is entertainment that jumps from the page to the stage, from the comedic to the satiric to the deadly serious”. In 2000 the National Australia Day Council presented David with an achievement award for his cultural/arts contribution. In 2010 David launched a major collection of his poetry titled 'Backwards: Selected poems 2010-1976'. 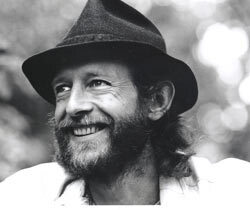 The publication of over one hundred poems traces back over 35 years from his most contemporary writing to his early poems while working at cotton and wheat harvests in the mid 1970's, through tours of outback schools to the Sydney Opera House to the beat cafes of New York. 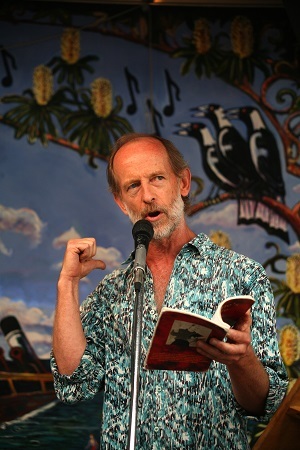 In 2011 David also launched a small collection of poems about Byron Bay titled 'Poetry Bay'. David Hallett is a consummate performer, who remains on the cutting edge of contemporary poetry in Australia. Click on a title to read one of David's poems.